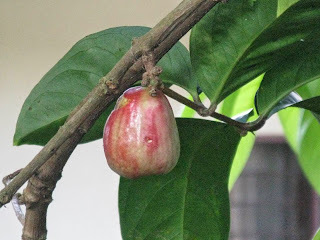 A month or so ago, Dan and the kids came inside bearing a new kind of fruit that I had never seen before: a rose apple. These were a new-to-us discovery in a neighbor's yard. 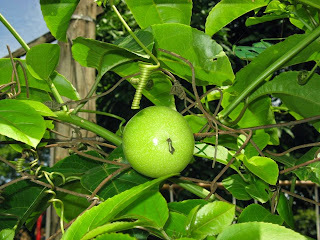 There were heaps of them ripe on the tree at the time and there were children climbing the tree and passing them down. They are lovely fruits – our plant guide indicated that they can be used to make jam, and I bet it would make lovely jam. We only had two so I sliced them and put them into a tossed salad with a balsamic vinaigrette, which was lovely as well. 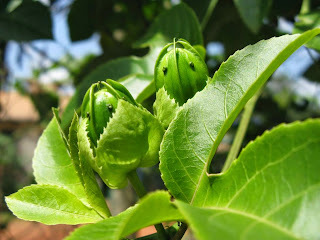 They are spicy-sweet with a texture similar to a pear. 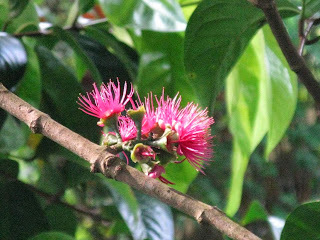 Later I went to inspect the tree from whence they came, and found out that the flowers are rather magnificent too. 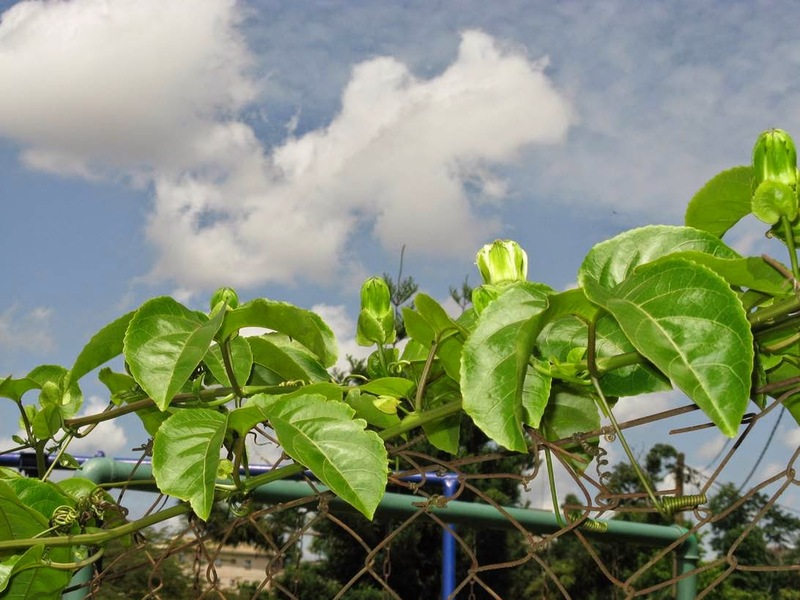 I also recently learned from a different neighbor that the vine we are growing along our fence is a passion fruit vine. When I was taking my laundry out one morning a couple of weeks ago, I noticed that there were buds all along the vine which I hadn't noticed before. 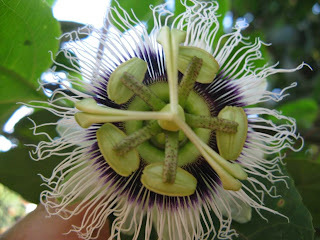 I also noticed an immature passion fruit, which puzzled me because I had never seen any opened flowers, just buds. How can you have fruit without any flowers? It wasn't until a week or two later that I finally noticed a passion flower blooming on our vine. Aren't they magnificent? They seem to be very short blooming flowers. I noticed this one late in the afternoon on one day, and by the morning it was shut up tight again. I never saw that same one open again, although I have noticed a couple of others open on the vine at other times – always very briefly. That would explain why we saw the fruits before the flowers – the flowers are fleeting, but so very beautiful if you do happen to catch a glance. Those flowers are beautiful--what a neat find.